Scope came to us to help them create a series of films for their ‘End the Awkward’ campaign. Life is full of awkward moments and Scope wanted to show how it doesn’t have to be as awkward when it comes to disability. 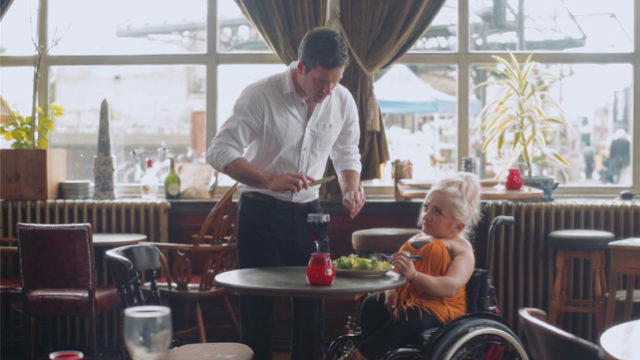 It was apparent from Scope’s research that people want to be friendly and helpful but can get it very very wrong, so we set out to create a series of humorous scenarios to illustrate the awkwardness from the point of view of the disabled person. Our approach highlights the many awkward moments that disabled people face on a daily basis, and challenges non disabled people’s perceptions on how to approach disability, with the aim of removing the awkwardness for both parties. The films were a huge success with the current total of views across YouTube and Facebook at 182,212 and an 84% attitude change within the target audience.